Thank you for all your kind thoughts on my last post. I’m going to try and write more often, here, which of course means that this will be my last post for quite some time. That last sentence tripped out so easily and funnily enough the sentiment that lies behind it – that my efforts, whatever they are, are absolutely bound to fail – is exactly what I wanted to write about today. A wise woman who I’m lucky to call a friend, Nike Lawal, told me about Impostor Syndrome a couple of years ago. If you’ve not come across this particular phrase before, let me explain: it’s the feeling that, despite cold hard evidence of success, you are actually a failure. That at any moment someone is going to find you out and reveal you to be a fraud. That your success is down to luck, or accident, or something other than your own capability and hard work. I’ve felt this all through my life although I never had a name for it. Today, having read a particularly brilliant article that Nike shared on Facebook, I’ve been wondering in an oblique sort of way where it comes from. Without wishing to get into an intense debate about feminism because men suffer Impostor Syndrome as well as women, in my own case as a girl I know I was brought up to believe that certain attributes were preferable to others. Bragging about your achievements is bad. Being modest about your success is good. I don’t think the boys at school had quite the same pressure to keep their feelings about their success to themselves, but then I’m not a boy – I’m basing my opinion there on how they behaved, not how they felt. The external manifestations of the way you deal with success (by bragging or being modest) are all fine as long as, inside, you’re still able to celebrate and be proud of yourself and give yourself a little fistbump…. or is it? If your face says one thing and your heart is saying another, then that’s what the world considers ‘fake’, right? And that particular word feels to me like one that is used, in this context, primarily by women about other women. In other words, our society sets you up to fail at every possible turn; if you’re female and successful, you can’t brag about it and you can’t keep your pride to yourself without being ‘fake’. In other words, Impostor Syndrome – genuinely believing that you are not as good as you appear to be – is the only way you can be successful and still be acceptable to society. Small wonder it’s such a battle. I’ve written about writerly jealousy and my own struggles with that before, but again Impostor Syndrome is something to which writers – male and female – are particularly susceptible. This is largely because the industry we are in sets us up in competition with each other. We are individuals, writing unique books, and yet pegged into a system that tries to get us to fit into slots – genres, sections of bookstores, publishing schedules – and then compares us endlessly to other individual writers, as if trying to establish a giant hierarchical list in which one of us is a better writer than another, or one book is better than another. We compete daily on bestseller lists, Amazon rankings, review space in newspapers, book club recommendations; for agency representation, publication contracts, marketing spend. We – as writers – try to find our own place in this hierarchy and inevitably feel awkward about it. Placed where we are by circumstances utterly beyond our control, we can’t help but compare ourselves to our competitors peers. Those who are ‘above’ us (who are getting a bigger slice of the marketing budget, or who are top of the charts, or whatever) are subject to our envy, if our book feels better than theirs; those who are ‘below’ us, whose book feels better, make us feel like we are a big old fraud. If we happen to be – however briefly – the top of a heirarchical List, that’s when we get hit by Impostor Syndrome harder than ever before, because it can’t possibly be true that all the books below us in the List are worse than ours. Someone is going to notice, and then we’ll have to admit to being a failure after all – right? (Note: It’s not about how good your book is. The List is generated by hugely complicated algorithm involving such random things as marketing, word of mouth, little editorial decisions, supermarket buyers, sales reps, Twitter, reviewers, the weather, the economy, Amazon’s internal algorithms which are something else entirely, whether you’ve accidentally tapped into a zeitgeist thing… the variables are endless, and utterly uncontrollable or definable). What’s even worse is that NOTHING we do as writers can control it. The only result from all of this comparison is that we end up feeling bad (and that stress makes being creative really, really hard – see my last entry). None of it is real. It’s all a big cardboard cut out, a stage set, a performance, designed to sell books. Once you’ve realised how, actually, no book is really any better or worse than any other book, all that’s left is for you to get on and write the next one, and try not to worry about it. Now you may think that I’m spouting a whole lot of nonsense given my own unwavering support for NaNoWriMo, which as we all know is all about the competition. You even get a little chart! You compete in Word Wars! If you don’t hit 50,000 words you’re a failure, right? So how’s that supposed to help with Impostor Syndrome? I’ve been mulling this over this morning and I realised something interesting. Years ago, one of the ‘tips and tricks’ I used to use during November was to use the ‘search’ function on the NaNoWriMo site, pull up the list for EVERY SINGLE PARTICIPANT, sort by word count, and then find myself on the list. Let’s say I was at number 29,432. I’d then find someone else (randomly, but often I’d choose someone in my country, or writing in my genre, or my age) who was maybe 200 places above me in the chart, and I would make it a goal to try and get above them in the list. The person concerned was never any the wiser, but my competitive streak was fired up, and then determination would kick in, and so the word count would rise. Next time I’d log in, no doubt the person had overtaken me again, and so I had a new target to aim for. A few years ago the option to do this – to pull up the list of every participant – was removed from the site. I’m guessing this had more to do with the logistics of managing that ever-increasing amount of data with servers that were run by a non-profit organisation than the need to remove the competitive element to the challenge, but even so it feels interesting to note that it’s now much harder to compete with others. The ‘word war’ and ‘sprint’ challenges SOUND like they are competitive, but really they aren’t. 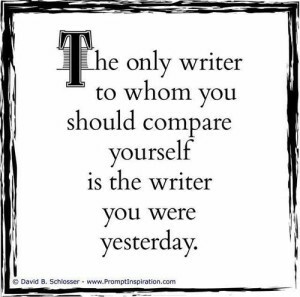 You are only ever competing with yourself. You get a cheer if you beat your last count, or your personal best. There is no point really competing against the person sitting next to you, because they may be faster at typing, or they might be handwriting, and in any case you’re writing your own novel, not theirs. I’ve rambled on for a long time and I’d like to come up with a really pithy conclusion… but all I can do is urge you to read that original article, and if any of it rings true for you, follow the advice contained therein. So, my lovelies. Spread your wings. Be proud of yourself and everything you’ve achieved. Celebrate the beauty of your words, knowing they are yours and only yours. Your book is beautiful because you wrote it. Excellent piece. Great to have people talking about this and challenging it. Those who experience Imposter Syndrome are in good company! Sadly the more talented and successful we are, and become (in whatever field), the more likely we are to experience it: but it doesnt have to be this way as you know and state. My new 1:1 programme is designed to explore and address the roots and experience of this for each client and address it! I just finished ‘Into the Darkest Corner’ and let me say bravo! I’m not a novel reader — usually I stick to true crime — but somehow this novel really drew me in. I read it in a few days, which is very rare. Another thing… As a man, we don’t necessarily understand the emotional damage that is done by stalkers, because we take up the male POV. I even read true-crime about stalkers because they’re fascinating. After reading this novel, I got an idea of why women in abusive relationships stay with, and often defend, their stalkers. It’s a psychological wound that goes deep, deep, deep. Before, the topic was mysterious — someone being hunted, just like in the movies. Oooh, how eerie! Well, those movies glorify stalking, which is a disservice to stalking victims. Thanks for un-glorifying it for me! Thank you for your lovely comment, Casey! Glad you enjoyed it. 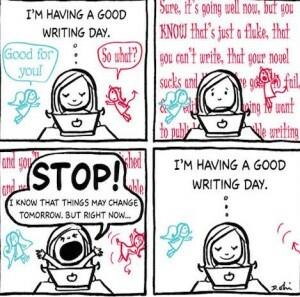 « Sometimes it’s hard to write, right?